Is there treatment and can my dog be cured? Can I afford the diagnostic tests and treatment? What a horrible position to be in! Yes, advancements in diagnoses and treatment plans are helping dogs to live longer lives with a better overall quality of life. Studies show that owners are increasingly opting for treatment to extend life rather than opting to euthanize. If you are concerned about being able to afford the diagnostic tests and the recommended follow-up or palliative care, then read on. Below, you will find 3 cost-effect strategies to help reduce the cost of treating brain tumors in dogs. This is done through a physical examination. The veterinarian will measure your dog’s reflexes, sensitivity to light, and condition of the pupils. Results of blood work done will indicate whether the organs (kidney and liver, for example), are working properly. A chest x-ray will show whether there is cancer in the lungs. Cancer in the lungs or elsewhere in the body could hint at a metastatic brain tumor. If you are feeling guilty right now, I totally understand. It’s hard to talk money when your beloved dog is sick. After all, you don’t want people to think that you are trying to save a buck at the expense of your dog. Do not just compare dollar-for-dollar; make sure you understand what treatment options are included in the final tally. Pay attention to how you and your dog are treated. Neurology Services at Perdue University offer these trials as a way of testing new treatment methods. The benefit of taking advantage of a clinical trial is the significantly reduced cost, and the fact that your dog will be treated with the newest, cutting-edge technology. Your dog will not be used as a guinea pig. Treatments offered have been approved. Now, it’s just a matter of getting that real-world look at how the brain tumor responds to it. As of this date, June 6, 2018, their website shows a clinical trial for dogs suspected of having a brain tumor. To gain acceptance for a clinical trial, certain processes have to be completed. Requirements for acceptance are on the Purdue University website. Take a look at this tweet. It appeared last year, but the information on clinical trials (see the link in the tweet) might be useful for you. This is Pretzel. Her brain tumor shrank by more than 40 percent. If you are interested in learning more, please visit their website. This is where you will find all of the frequently asked questions and contact information. Ask about the availability of subsidies! Pet insurance plans are comprehensive and offer various price-points. It’s important to understand that insurance companies typically won’t accept your application if a diagnosis has already been made by a veterinarian. There are several pet insurance companies and it is worth your while to explore them all. If you cannot get insurance for your dog right now, it might be worth thinking about for any other animals you have. I highly recommend checking out this excellent YouTube video. This man has gone through the experience and provides a lot of insight into what to expect. The veterinarian is going to want to provide the best treatment options for your dog. Comprehensive diagnosis enables the veterinarian to see the whole picture. When he/she has that information and is confident in the accuracy, a customized treatment plan can be established. However, if you cannot afford it, the veterinarian would rather come to a reasonable compromise than have you leave with no treatment or diagnostic plan in place. 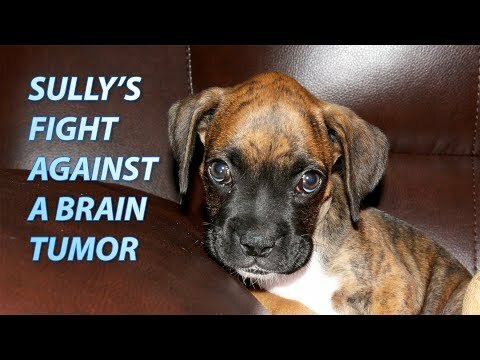 Brain tumors in dogs are not always evident right away. Symptoms could be vague or non-existent in the early stages. Below is a comprehensive list of symptoms, and the type of brain tumor that could be causing them. Please keep in mind that some of the symptoms noted below could also be related to an underlying or preexisting condition. Primary Brain Tumors: The brain tumor developed on its own, within the brain, without other signs of cancer throughout the body. Secondary Brain Tumors: These tumors, called metastases, start as cancer in another part of the body then spread to the brain. It is estimated that 1 in 4 dogs will develop neoplasia at some point. The definition of neoplasia: “uncontrolled, abnormal growth of cells or tissues in the body”. Keep in mind that not all neoplasms are cancerous (malignant). Malignant neoplasms are unpredictable and will invade other parts of the body. Circling can also be caused by Vestibular disease, liver disease, poisoning, stroke, infection. Brain tumors grow and press on the brain. This intrusion affects cognitive function. Dogs with diabetes, toxicity, infections, and pain may also exhibit this symptom. Cerebral tumors will typically cause behavior changes, seizures, visual deficits and circling. This type of tumor develops within the cells that produce cerebrospinal fluid in the ventricles of the brain. It is not commonly seen. Blindness and/or dilated pupils that are not responsive to stimuli. Head tilting can be any number of things including an ear infection or a vestibular syndrome. Your dog might tilt his or her head in response to a sound or command, but if you notice it happening continuously and frequently, you should bring the dog to the vet. Brain stem tumors will typically cause depression, head tilt, cranial nerve deficits, weakness and ataxia. Sometimes seizures are idiopathic, meaning there is no known cause. Your dog might have one seizure, and never have another one. Other causes of seizures in dogs include liver disease, kidney failure, toxins, or some other sort of brain trauma. This type of tumor occurs within the skull and accounts for about 10% of diagnoses made. Mild to moderate hearing loss in dogs can also be caused by wax buildup, scar tissue from ear infections, and birth defects. It can also happen to older dogs. Cerebellar tumors occur at the back of the brain in the section that coordinates muscle control. As stated above, symptoms of a brain tumor might actually be something else entirely. Remember to let the veterinarian know exactly what types of supplements and over-the-counter medications your dog is taking. Even “natural” supplements can interact with prescribed medications. I want to offer you luck and an excellent prognosis for your dog. My heart goes out to you, and I hope you can find the best possible treatment options. Thank you for reading this post. I hope you were able to get valuable, usable information from this post. To learn more about me and what brings me to blogging, please check out this link. I am not a veterinarian. My intent is to resource quality, peer-reviewed, texts to deliver to smart dog owners like you. Thank you for this extremely well-written article on canine brain tumors. We received the gut-wrenching diagnosis several weeks ago that our beloved bichon frise, Hercules, age 11, has a meningioma brain tumor. Within 24 hours of his diagnosis, we were told of and accepted into a Clinical Study at the NIH Cancer Center in Bethesda and VA Tech Vet Hospital here in Blacksburg VA. Following 6 weeks of a new chemotherapy treatment trial, the NIH will pay for removal of his tumor at VA Tech Vet Hospital. Everyone involved in this entire operation has been kind, compassionate, and caring of little Hercules and of us. We leave this Sunday for his first ( pre-treatment) PET scan. We believe strongly that diet and proper supplementation play an equally valuable role in strengthening the body to fight cancer cells and thus feed our dogs a nutrient-dense organic, home-made whole food diet high in protein and valuable fats and low in carbohydrates. We will visit a holistic vet following his surgery for supplementation consult. We continue to pray that the two modalities together will enable our mighty little 10 lb Hercules to obtain as much quality time of life as possible. We are so very grateful to be living where we are which provided immediate acceptance into this Clinical Trial. Information obtained from his treatment will help to serve other dogs with meningioma tumors as well as human beings fighting the same. Oh no Beverly! That’s every dog owners worst nightmare I’m sure. This sounds like a good clinical trial he’s on. You mentioned quality of life, which is hugely important. Sounds like Hercules has some pretty Herculean doggy parents! Lucky dog! Please keep me up-to-date on his progress. I’d love to know how it all goes. Thanks for writing!